What is a good solution for image/video asset file management? We are a small agency and over the years have amassed tens of thousands of image and video files. We have then on an internal share under category specific folders but this is becoming unwieldy. It is tough to search and find the right asset, as some images span multiple categories. For example a photo of an attractive woman doing a business presentation in an office setting could have the following tags: business, woman, attractive woman, presentation. We'd like to have the capability of, say a BigStockPhoto, internally. What do you recommend? I've heard that Box (the cloud-based file storage solution) has tagging capabilities that allows you to do what you describe. The only problem is you would need licenses for all of your users, which can get expensive quickly. Hover over the item you would like to tag, then click the ellipses (...) to open the More Options menu. Alternatively, you can right-click the item. 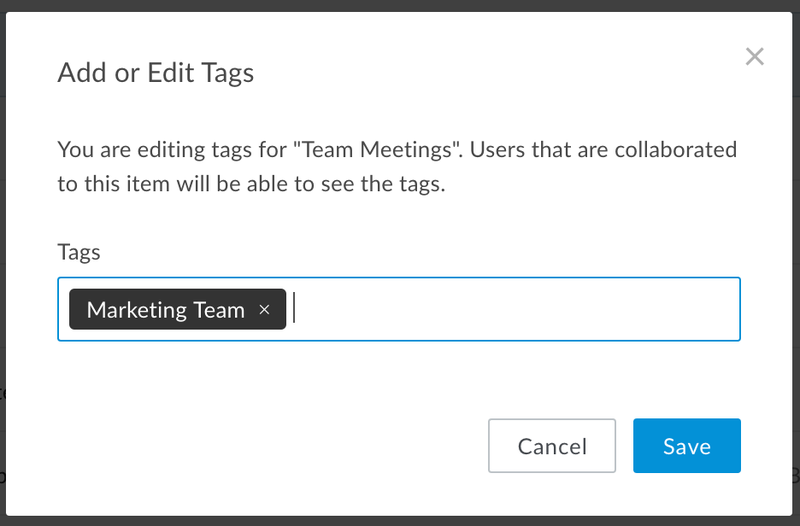 Under More Actions, click Add or Edit Tags. In the pop-up window, enter the tags you would like to add to this item. You can add multiple tags, seperated by a comma. Click Save once you are done.